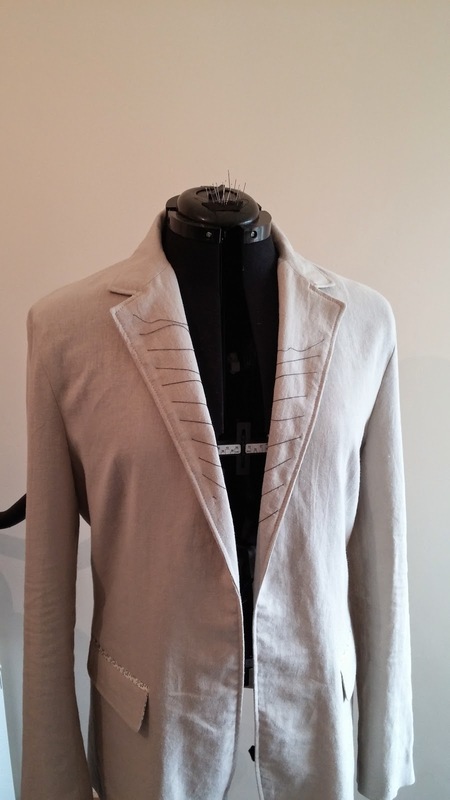 So part 3 of my Linen Jacket sew-along and we move onto the collar/lapels and sleeves. All three are enough to put fear into anyone who sews. 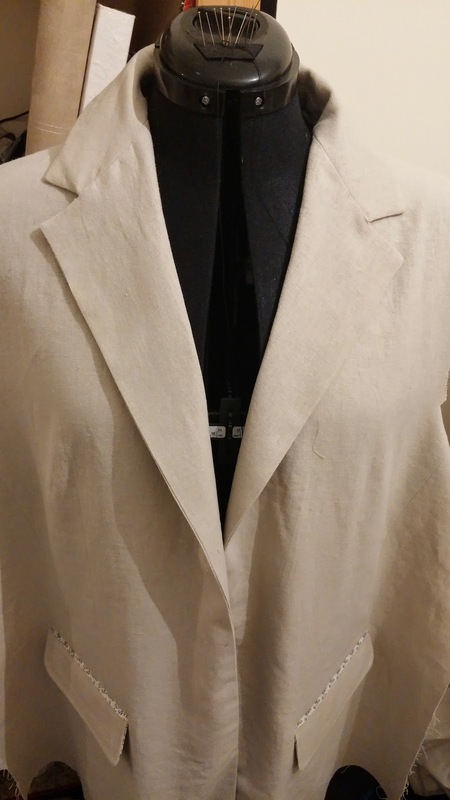 I look back at my first jacket and wince when I see a wonky collar; notched lapels where the notches were different shapes and sizes and sleeves with more puckers and creases than a dried prune. Now, I enjoy the challenge and hopefully can show you my process. I do deviate from the pattern instructions here but not too much. 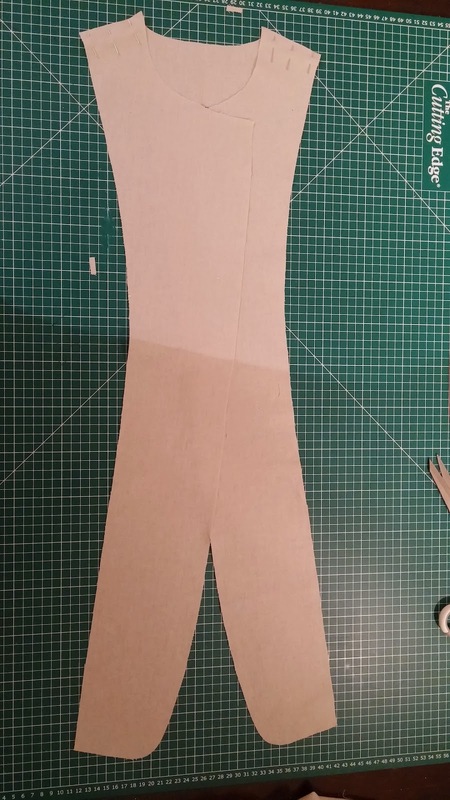 OK front facings and neck facing are stitched together RST and seams pressed open. The collar is made up of Upper and under (cut on fold) and 2 collar stands. 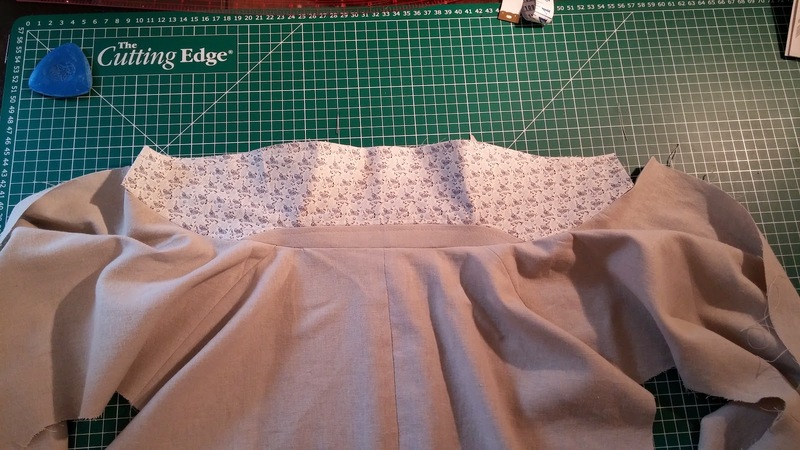 I intend the under collar to be made from the patterned material I used inside the pockets. 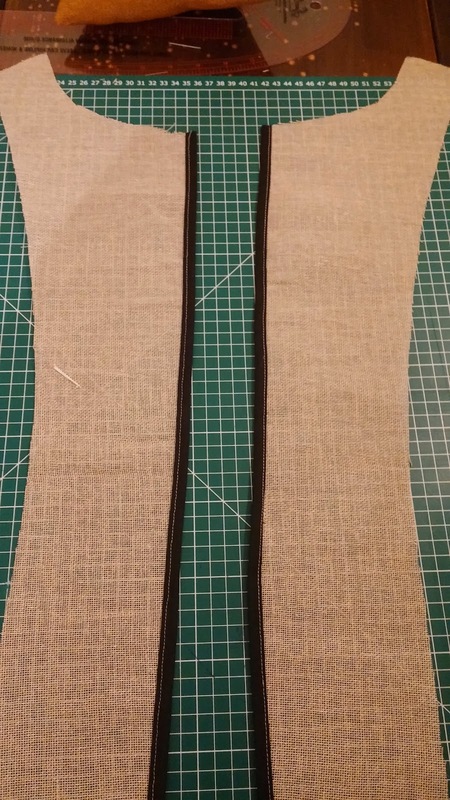 Pin and stitch the upper collar to a collar stand matching seam markings RST. 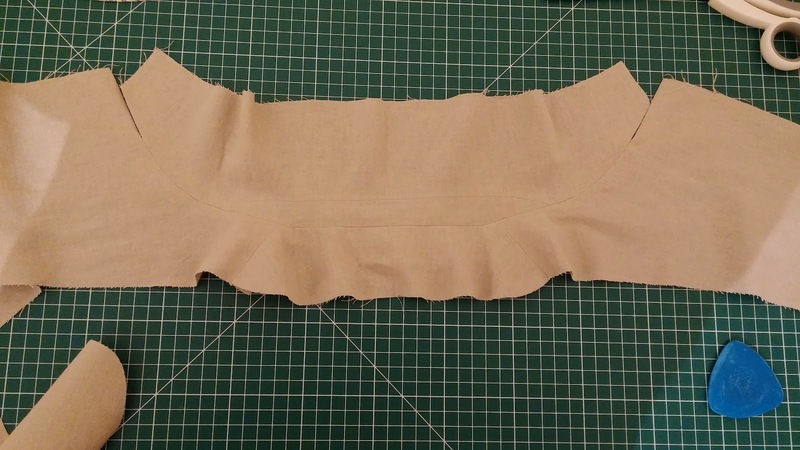 This can be a little tricky as you need to join 2 curved seams so take your time. After stitching clip the curved seam and trim. 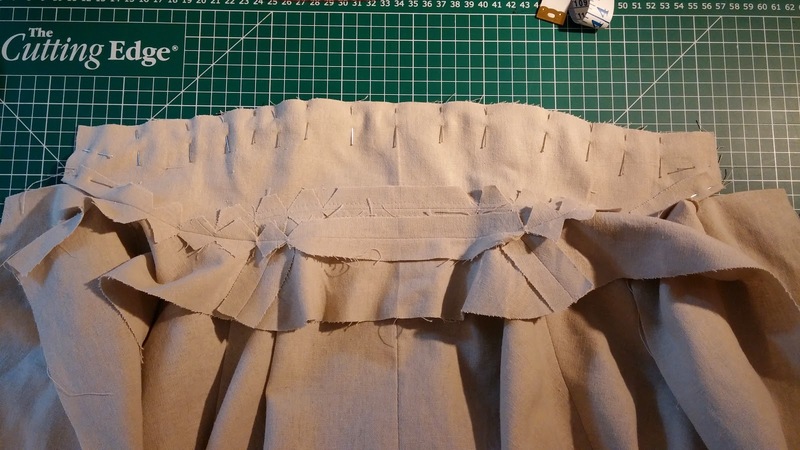 Press open and top stitch either side of the seam line. Now repeat for the under collar. 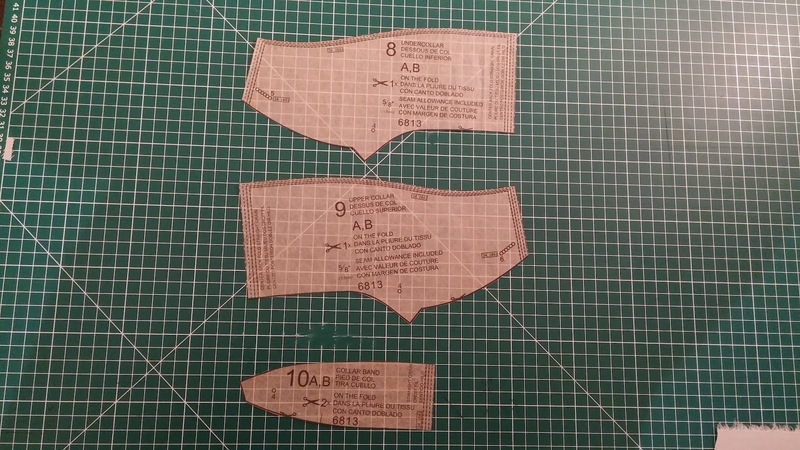 This time I have interfacing applied to the pieces (That’s why collar stand looks white). That’s the collar pieces finished. Now we attach the upper collar to the facings RST. 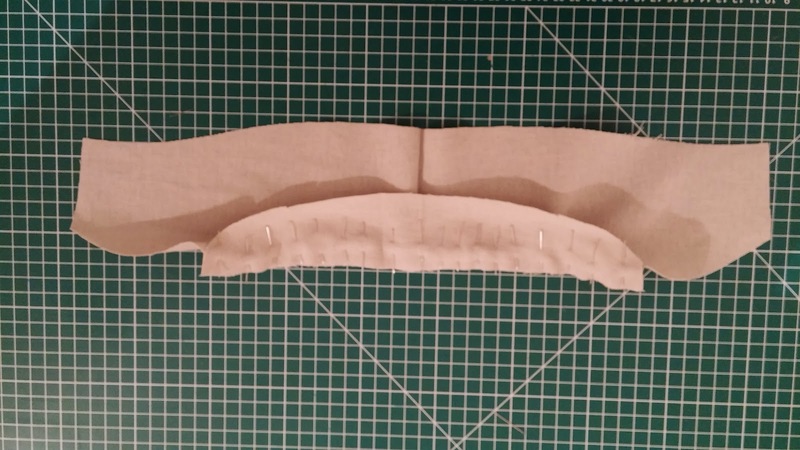 Again take time as you are trying to get two curves to fit together Measure and ensure that each end of the collar is the same distance from the end of the facings!. Stitch. 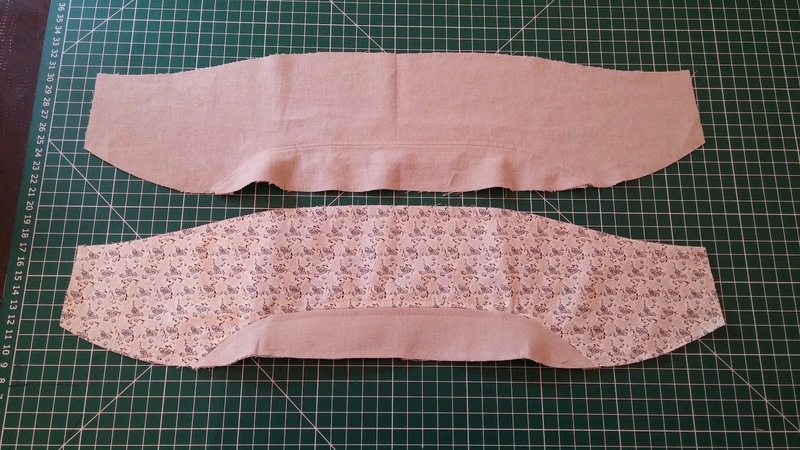 The pattern clearly indicates the end of this line of stitching. Completed upper collar and facings. 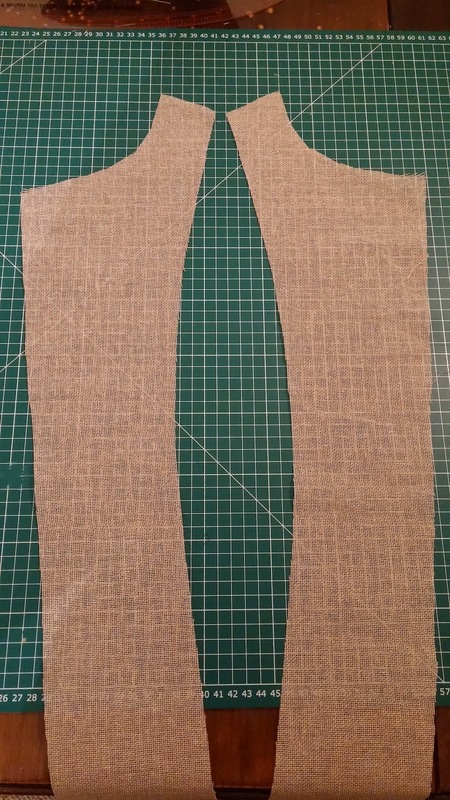 Seam clipped and pressed open. Now repeat for under collar but attach to the jacket. Clip seams and press open. Right that was the easy bit! Now comes the time to attach the 2 collar pieces. Put the collar pieces RST and baste. Stitch the two collar pieces together but stop exactly on the ends where the collar meets the lapel. Clip the corners of the collar close to the stitch. 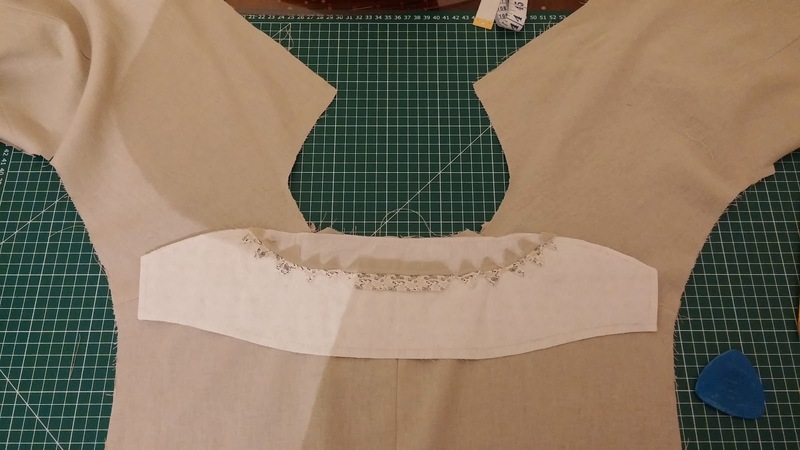 The upper collar is slightly larger than the lower, so gather carefully as you stitch. 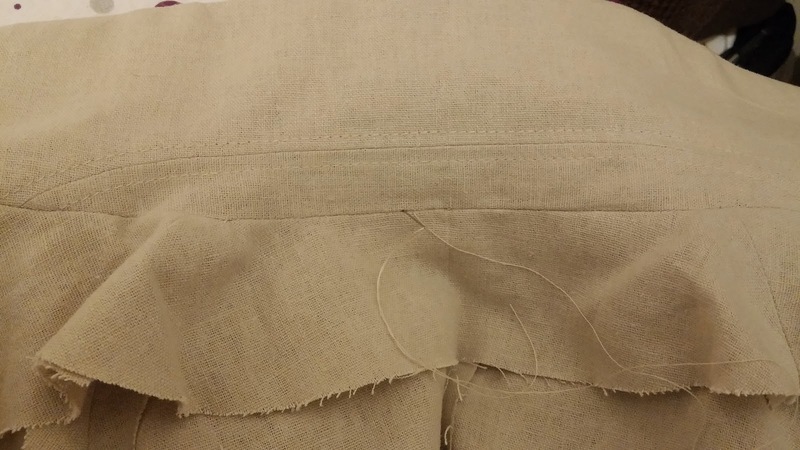 Now clip the lapel (on the jacket and facing) to meet the end of the seams you just stitched. 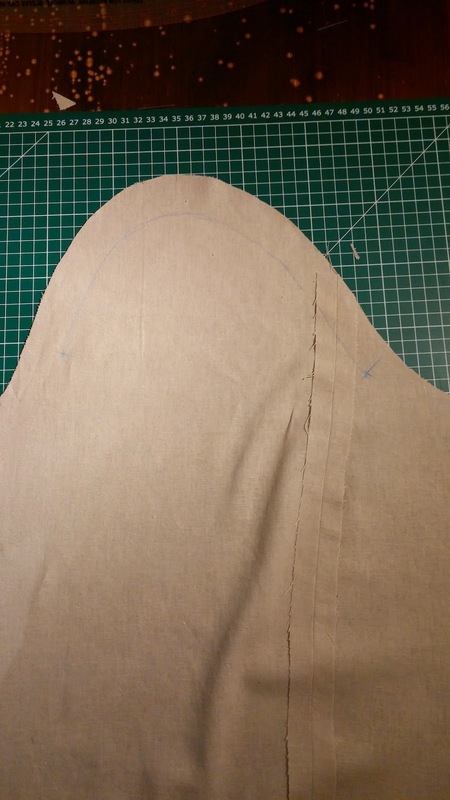 Fold the seam up to match, pin, baste and stitch the facing to the jacket (RST). This is from where the end of the collar stitching all along the front to the bottom. 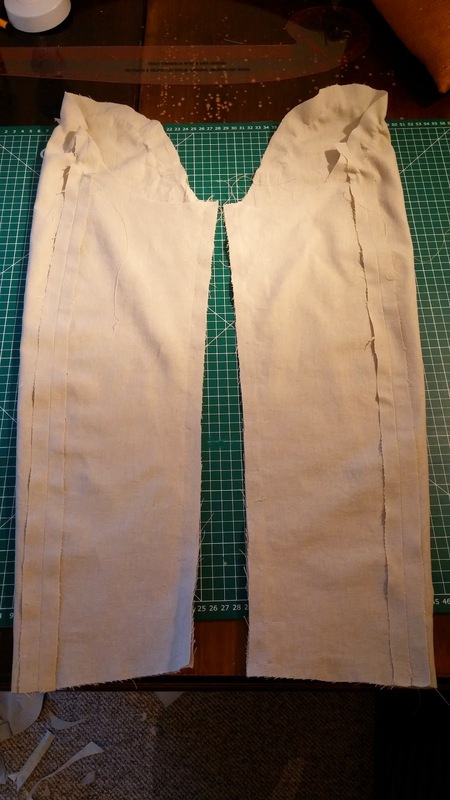 Clip corners and trim seams. 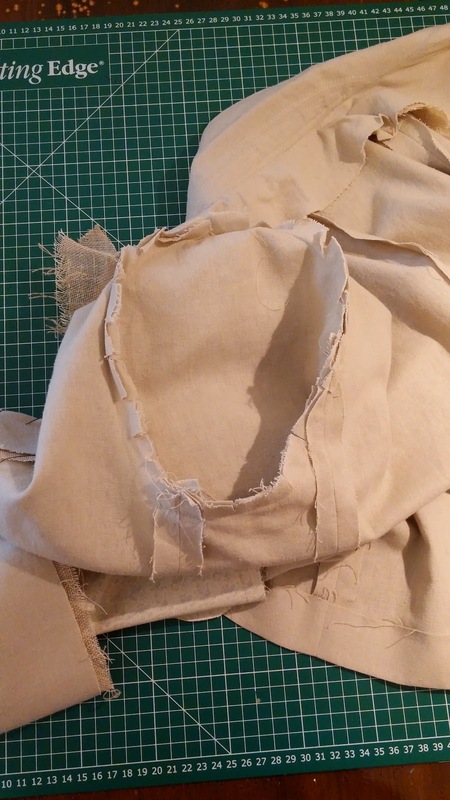 Fold the facings and collar right way out (Facings in the inside!) and carefully press. You should now have something that really does resemble a jacket! 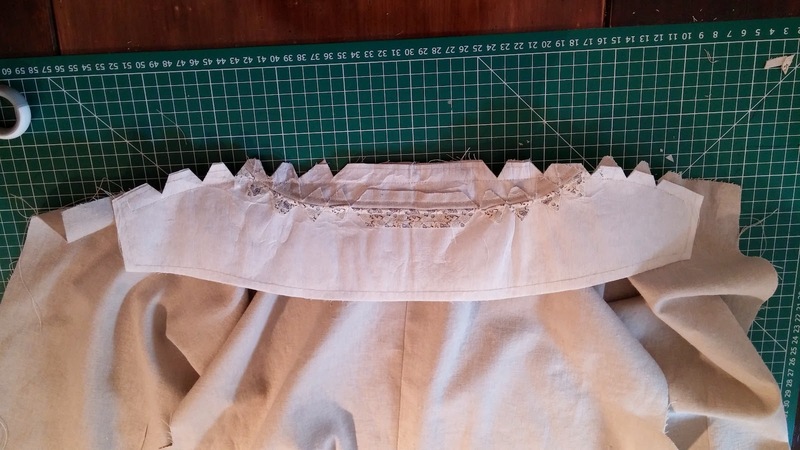 Now carefully hand-stitch through the collar stand (on the seam) joining front to back. CAUTION! Make sure everything lines up! OK! If you were paying close attention you will see I missed something out! Yes, of course there was no interlining between the facings and jacket. Well here is my little trick. 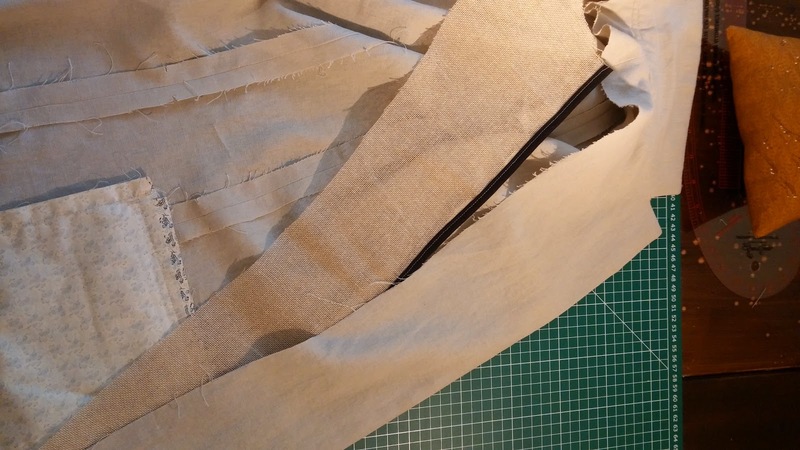 I use lightweight hessian for the interlining and add it to the jacket after affixing the front facings. The reason, I hear you cry…. Well attaching the interlining when joining the facing can leave a large, bulky edge along the front of the jacket. Cut as directed in pattern. 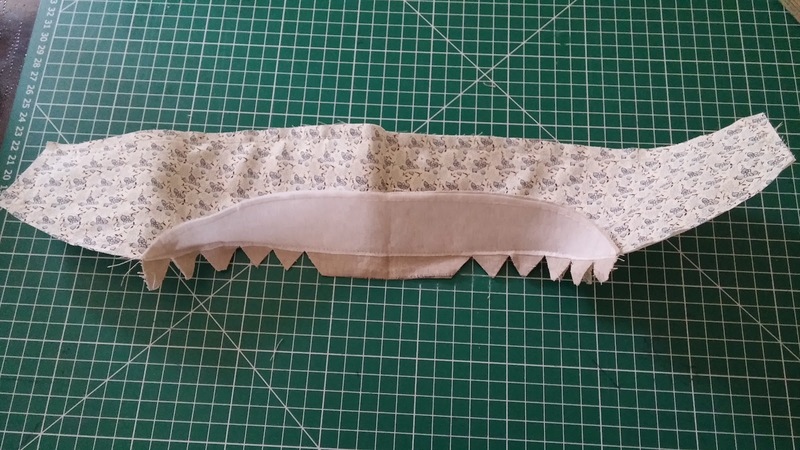 Add some bias binding to the edge that would normally be stitched along with the facings. 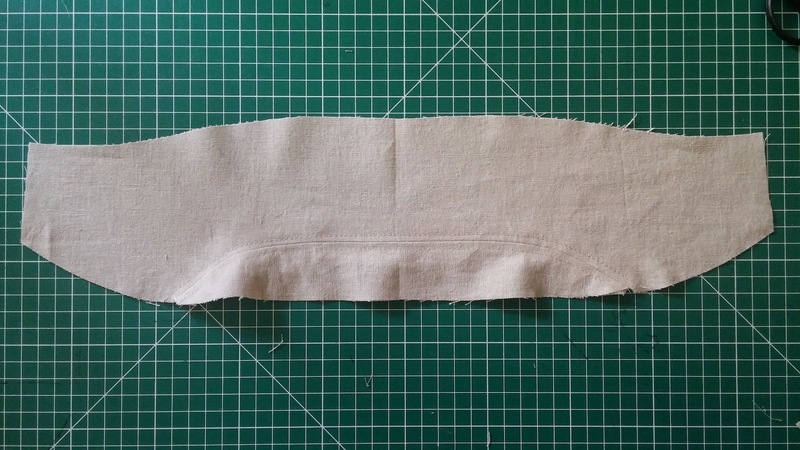 Slip the interlining into the jacket between the facing and front. 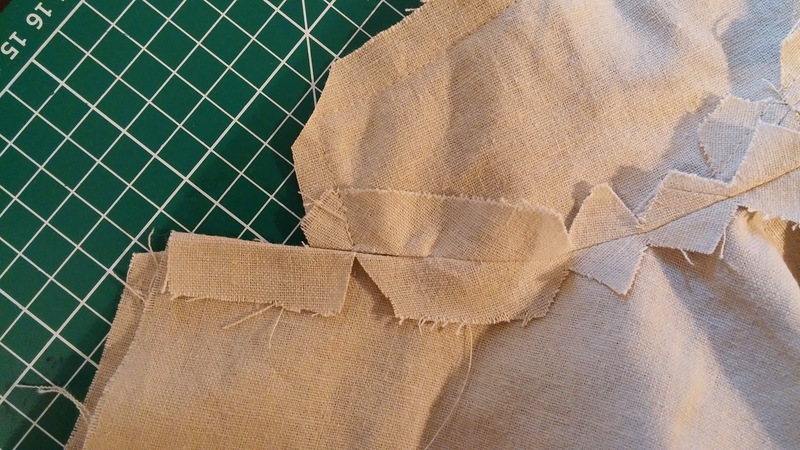 Make sure the bias bound edge sits flush to the stitch line inside the facings. Now topstitch the facing/fronts. This catches the bias bound interlining securing it in place. Now the jacket really does hang well. 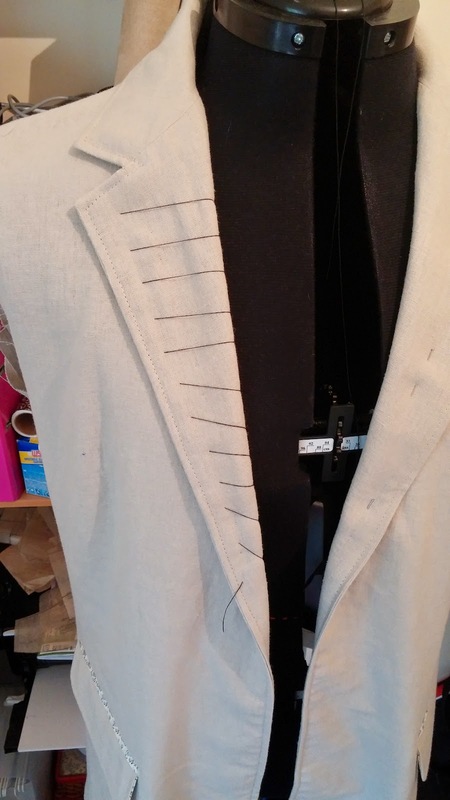 Press the collar/lapel and stitch with long loose stitches to keep the lapels in place. 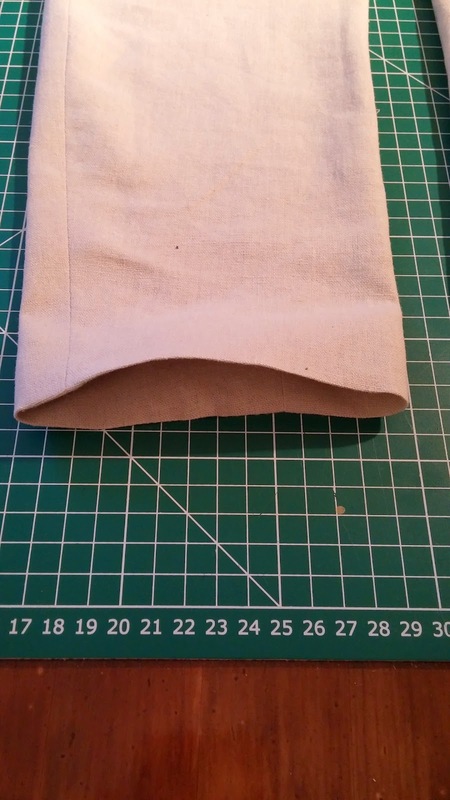 Sleeves are very easy. (This jacket has no sleeve vents, buttons or anything fancy. Just 2 pieces, per sleeve. Pin and stitch the long edges RST. Stitch short sides together and press. 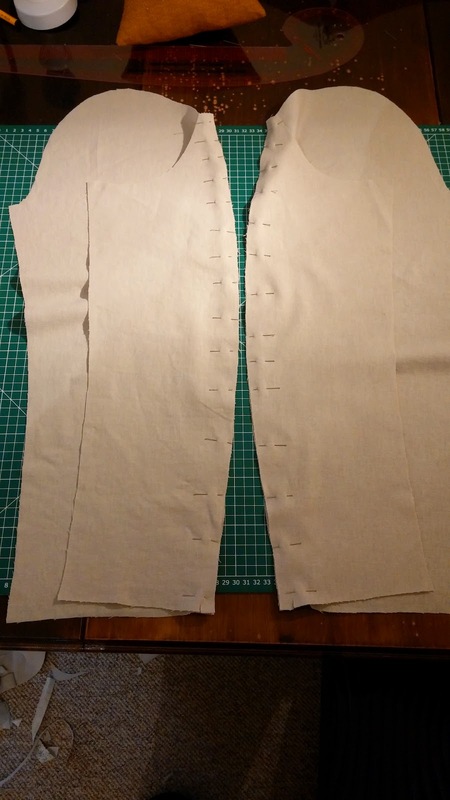 Pull on the stitching to gather the head of the sleeve and turn up cuffs. 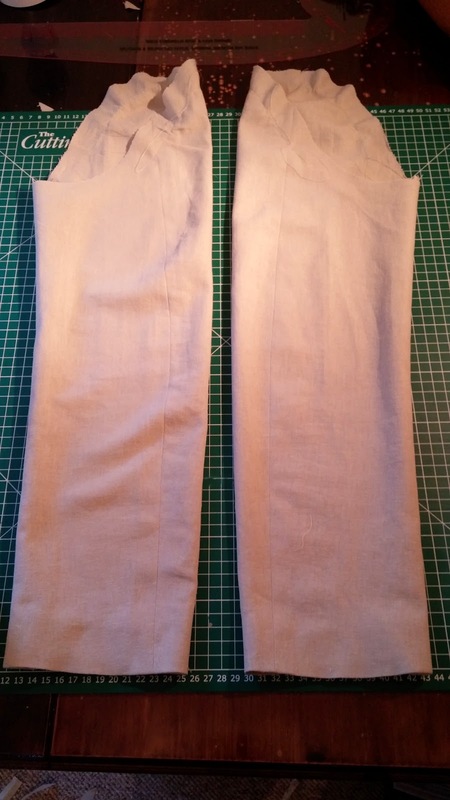 Press the cuff hems and turn the sleeves right sides out. Now set the sleeves into the jacket RST, baste and stitch carefully. The gathering stitches help to get the sleeve set in correctly. 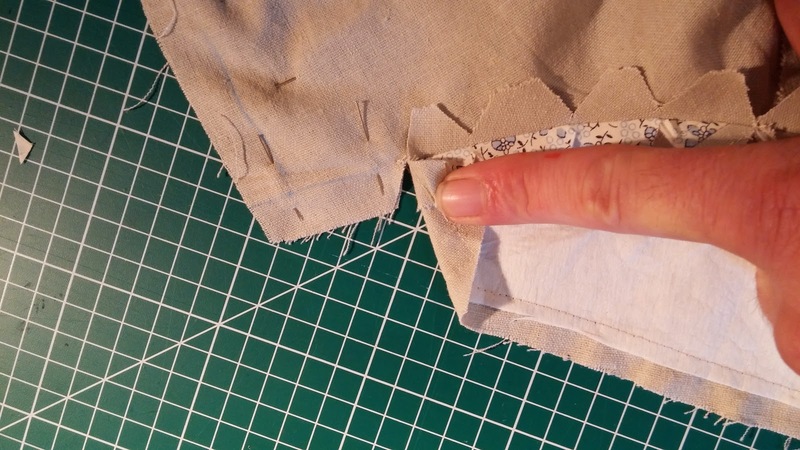 When the seams have been stitched, clip the seams and press. you should now have a jacket with sleeves. Well done if you have got this far. Time for a drink. We are nearly done, just the lining left to add and the finishing touches. 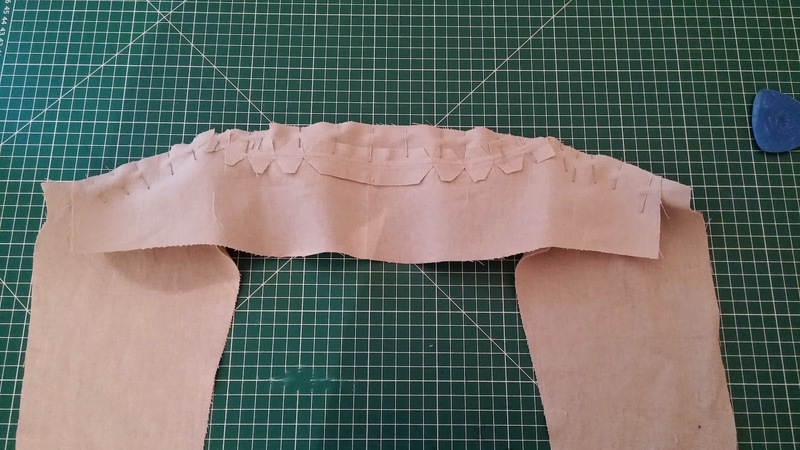 So until the next and final instalment…..Happy sewing. Jamie, i really appreciate the detailed steps in the jacket construction. It has been a very long time since I made one, so this is a great refresher course for me. Thanks and no problem I will, I have made many things, anything in polar fleece you name tops, jackets, stretch pants, have been in canada and the north east of the usa, i have dogs so i have to be warm when i walk them. I have also made shirts, pants, jackets, duvet covers, slip covers, pillow slips, curtains, recovered outdoor furniture, you name and i have done it. including woman's wear. However, i have never made myself a suit jacket so i am following this in great detail. General don't make shirts but .. and big but .. i have some great liberty of london fabric that is screaming for a shirt for myself. Believe I appreciate the help. 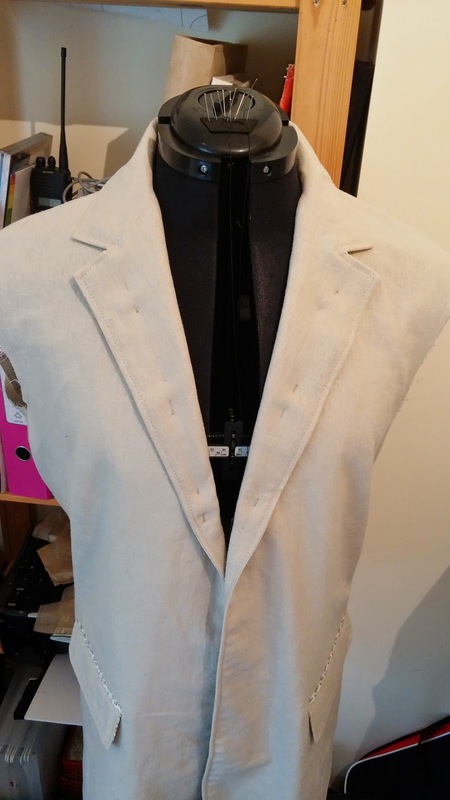 2. i missed some of the details on the vintage vogue suit jacket, what interfacing did you use. i love that jacket and wish i could find the pattern, but none are available online. its just a great basic jacket that is timeless. Hi, Nothing wrong with Liberty print! I've made several shirts using Liberty and love it. 1. 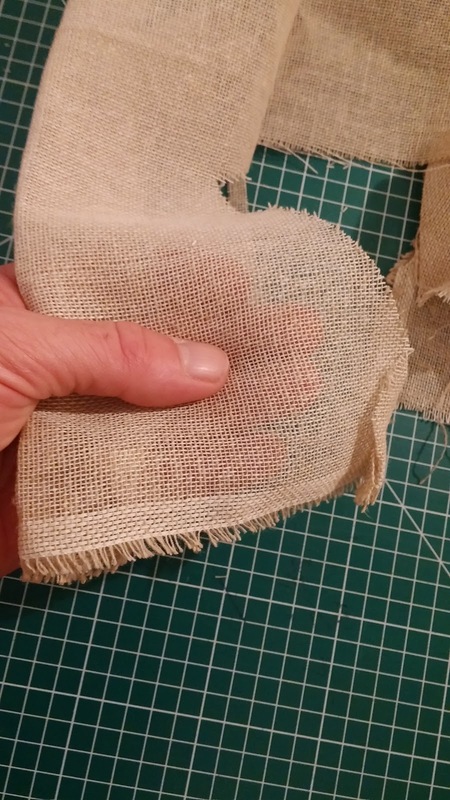 Yes hessian/burlap. I use lightweight generally unless the garment needs heavier. I use it in place of all the interfacings the pattern requests. Facings, collar, hem etc etc. For the lapel roll I run a line of triple stitching at the marked point and press. the burlap holds the shape really well. 2. Same as above although a slightly heavier burlap as I wanted a stiffer finish. Try EBay I found the pattern there and see them floating around from time to time. 3. 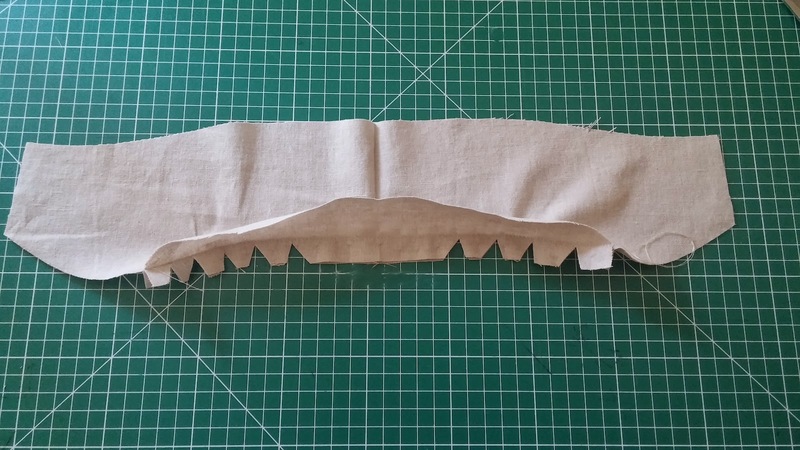 I never use fusible interfacing. Only stitch in or canvas. Yes takes a little longer but the results are far superior.